That-- the colors of the sea -- is what I told him when he said he wanted to make me a gift. But you see the real story here is that the time I spent with Georgios Chalkoutsakis on that warm Cretan afternoon was the real gift. 'George' as we were to call him before the day was over ( we couldn't master the Greek pronunciation), is a glass bead artist. And lucky for me his home/studio was only two doors down from Poppy's,where we stayed in Kastri on Crete's southern coast. My neighbor, a fellow tourist from Germany, had told me about George and apparently had told George about me because he was expecting me. He knew I was from America but had no idea where Seattle was located. He spoke excellent English and told me it was self-taught by watching television - Extreme Makeover is his very favorite show and he only wishes he could tell its star, Ty, how much he likes him. George would be described by some as 'handicapped', but I would call him gifted.. He is wheelchair bound as result of a premature birth. 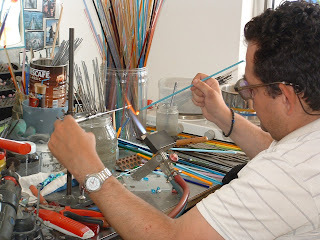 His hand movement is also just a bit limited but that hasn't kept him from perfecting his art of glass bead making. 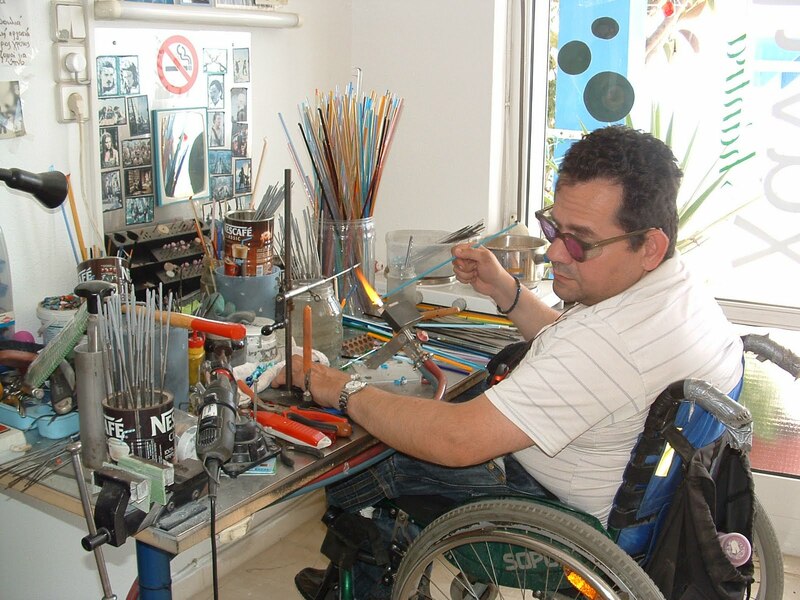 "If you have the time I will make a pearl for you," he said of the glass beads he creates. "What colors do you like?" It was then we agreed on the colors of the sea. After watching the bead being created and placed in the cooling sand, George and I settled in for a vist. We talked about philosophies of life, politics, both Greek and American, the difficult and sad times he had growing up as a child who wasn't the same as normal boys, and about what my life is like. Joel joined us sometime later and he also was treated to a pearl-making demonstration. We returned much later - after dinner - for my gift and decided that other pearls should be added to it and a necklace made. I became George's assistant: I held the glue. 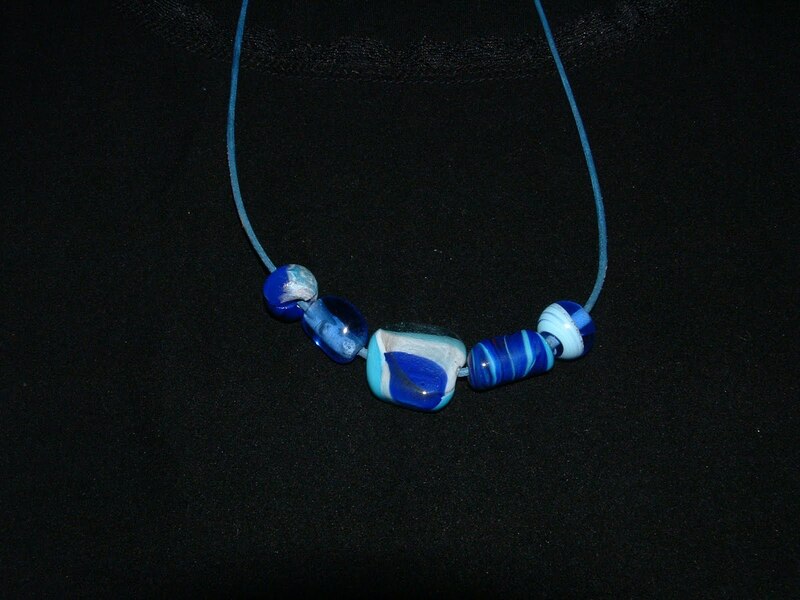 And it didn't take long until the artist had completed my necklace; I indeed had the colors of the sea. The price of the finished piece a mere 20E, but ias far as I am concerned, it is priceless! What a wonderful travel experience. This is an awesome blog! Love the necklace and the story that goes with it! I'm sorry for this this sad message. Georgios passed away last week in the hospital of Ano Viannos. All of you who have known Georgios will remember him in your own special way. We lit a candle for him. Beautiful story. I love reading travel stories like this one. Usually we buy a piece of jewelry or some other hand made craft without meeting the person who created it. What a luck person you are to be able to meet him. The necklace is beautiful! This sounds like an artist and a place I would love visiting. Art is always a part of our trips. 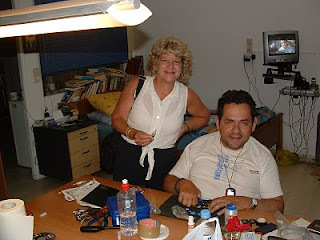 We have not been to Crete and hope to get there. What a beautiful necklace! Each bead will embrace a memory of your visit!